Do you guys follow Joanna Gaines on Instagram? (I know, dumb question.) But just in case you don't, I have a fabulous way to get your kids to eat a few vegetables. She posted this idea to Instagram a few weeks ago. I made it recently and loved it. Preheat your oven to 425 degrees. Line a cookie sheet with foil and line up your veggies. 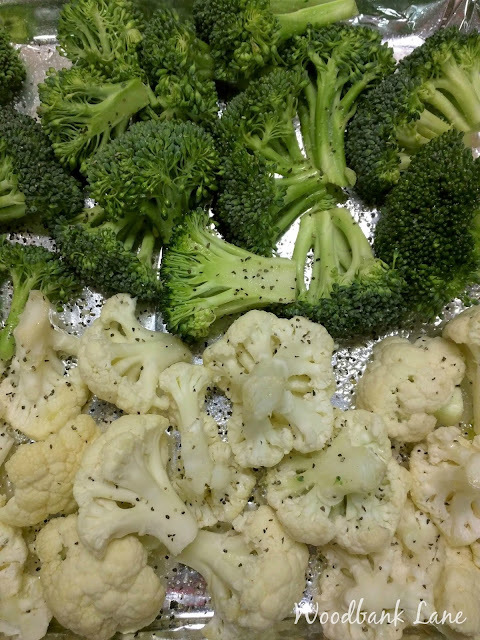 I cooked broccoli and cauliflower when I tried this. Drizzle vegetables with olive oil. Sprinkle with sea salt and pepper to taste. Bake for 20-25 minutes. And that's it! What could be easier. It almost tasted like French fries. :-) I forgot to take an after shot, but when the time is up, there will be a tiny bit of browning on the edges. Get ready for good! Have you tried any of Woodbank Lane's recipes? I'd love to interact with you guys in the comments. I'm a teacher, so I don't get to respond until later in the evening, but I read and look forward to each one. We liked asparagus cooked this way! Oh yeah, I'll have to try that. I've never cooked asparagus, but I do like it!